We are the authorised dealer for sale of KIRLOSKAR make PIG IRON. Kirloskar's pig iron is best quality product in both Steel & Foundry grade. 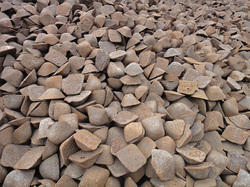 Foundry Pig Iron is raw iron, the immediate product of smelting iron ore with coke and limestone in a blast furnace. 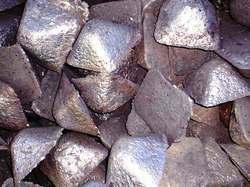 Pig iron has a very high carbon content, typically 3.5%, which makes it very brittle and not useful directly as a material except for limited applications. Wrought Pig Iron is typically poured directly out of the bottom of the blast furnace through a trough into a ladle car for transfer to the steel plant in liquid form, referred to as "hot metal." The hot metal is then charged into a steel-making vessel to produce steel, typically with an electric arc furnace or basic oxygen furnace, by burning off the excess carbon in a controlled fashion, and adjusting the alloy composition. Earlier processes for this included the Bessemer Process, open hearth furnace, finery forge and the puddling furnace.